I've been writing about how organic matter increases your cation exchange capacity (CEC), but, while that's true, there's more to the story. Clay also increases your CEC, and some clays have a higher CEC than others. A very young clay has a low CEC, middle-aged clays can have a CEC as high as 100, and very old clays have filled up all of those negatively charged sites with hydrated aluminum oxide and have a CEC as low as 5. As a side note before we look at the quality of my clay, Solomon explains that plant roots often stay out of the subsoil because it's too acidic and generally all out of whack. My powerline pasture test results support this hypothesis --- who wants to grow in a pH of 5 with barely any calcium? Now, back to CEC and clay. Interestingly, the powerline pasture has a higher CEC than the forest garden aisles do, even though the latter are higher in organic matter and have received more love. 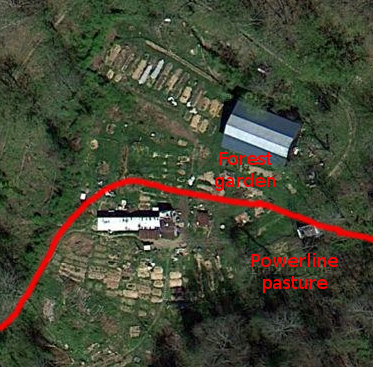 Soil surveys show a dividing line between two soil types just north of our trailer, and the front garden soil (on the same side of the line as the powerline pasture) is much higher quality than the back garden soil (on the same side of the line as the forest garden). Perhaps part of the reason the front garden is so nifty is that its clay has a higher CEC? Lest you think this post is sheer geekery, there is a hands-on point. Solomon explains that humus also has varying cation exchange capacities, ranging from 100 to 400. He writes that organic matter only changes into humus if there's some clay available, then he goes on to hypothesize that higher CEC clay creates higher CEC humus. While Solomon admits his hypothesis is untested, it makes me wonder whether it would be worth adding a bit of our higher CEC clay to the worm bin to see if we can't create even more awesome castings. As a final note on subsoil, Solomon recommends that those of us who really want to put down roots in our garden (both literally and metaphorically) should focus on rebalancing our subsoil at the same time we fix our topsoil. Adding gypsum to the topsoil leaches cations down into the subsoil, where they can increase the pH and bring the soil more into balance so it's more inviting to roots. Wouldn't it be fascinating if you could double your growing area by simply making the subsoil a better place to live? While you're planning ahead for spring, check out my 99 cent ebook to learn how to get the most out of your incubator. I just wanted to give you both a high five on your piece in Mother earth news. I got it the other day ans was paging through and I said to myself...hey that is Mark and Anna...how cool. Kevin --- Thanks for noticing us!